Today, I’m going to take a look at a truly bizarre, one of a kind film: 1977’s Hausu. A schoolgirl and six of her classmates travel to her aunt’s country home, which tries to devour the girls in bizarre ways. 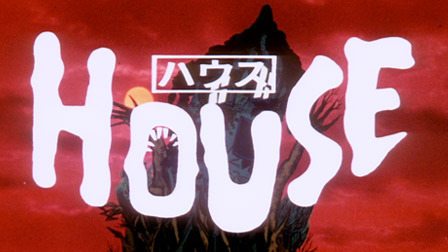 Hausu was directed and produced by Nobuhiko Ôbayashi, who was previously known for doing a fair amount of television, short film, and commercial directing in Japan. Obayashi, or “OB,” also provided the film’s distinct special effects, and was notably the primary advocate for the film during its tumultuous pre-production. While he has continued to make many films over the years, and is considered a celebrity in Japan, Hausu is by far his film with the most international recognition and acclaim. Serving as the production designer and assistant director for the film was Kazuo Satsuya, who provided design work for two other notable cult movies: Lady Snowblood and Godzilla vs. Mechagodzilla. One of the producers for Hausu was Tomoyuki Tanaka, a Toho producer who had a hand in the creation of countless Japanese cinema classics, including monster flicks like Godzilla, Rodan, and Mothra, as well as Kurosawa features like Yojimbo, The Bad Sleep Well, Kagemusha, and Sanjuro. A number of the most distinct elements of the film were based on ideas collected from OB’s young daughter prior to the writing of the screenplay. He has said that he asked his daughter for ideas because “children can come up with things that can’t be explained.” Among the many ideas from his young daughter that made their way into the final film were the hand-eating piano keys, the very concept of a killer house, the watermelon-head being pulled from a well, and the bizarre pillow attack. Following the project getting a green light from Toho, none of the Toho staff directors wanted to take it on, fearing that the film could easily be a career-ender due to the screenplay’s outlandish concept. After it sat unproduced for 2 years, OB, the film’s primary driving force, was given permission to direct. Toho was initially hesitant to let him take the reigns, specifically because he wasn’t on staff with the company. 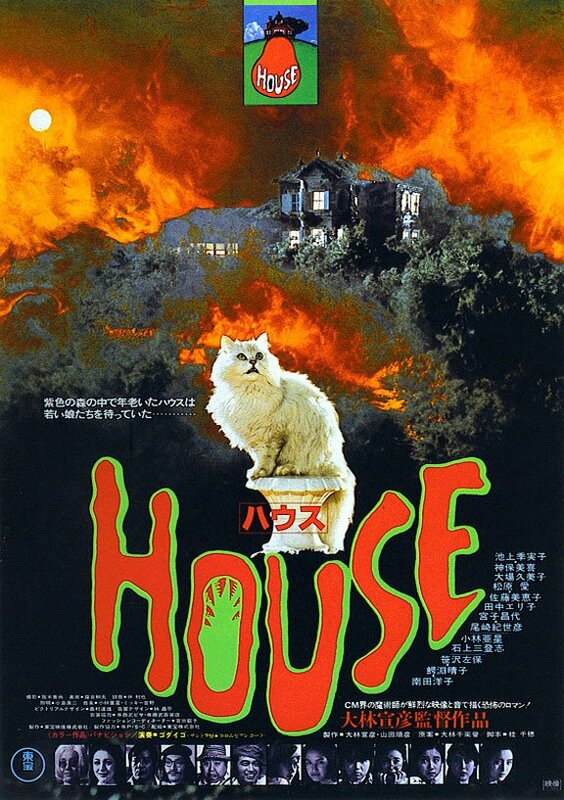 Hausu finally got a theatrical release on July 30, 1977 in Japan as part of a double feature. It wound up being a surprise success, as it particularly struck a chord with cinema-going youth. Despite its popularity, the film didn’t make it officially to North American theaters or homes until well into the 2000s. The Criterion Collection, which is known for distributing influential and well-regarded films on home video, released DVDs and blu-rays of Hausu in October 2010, bringing a new audience to the film. Hausu has had a complicated history with critics: Japanese critics didn’t care for it initially when it was released in theaters, but its long-belated release in North America led to a critical re-evaluation decades later. North American critics have mostly praised it, and time has solidly cemented the movie as a memorable cult classic. 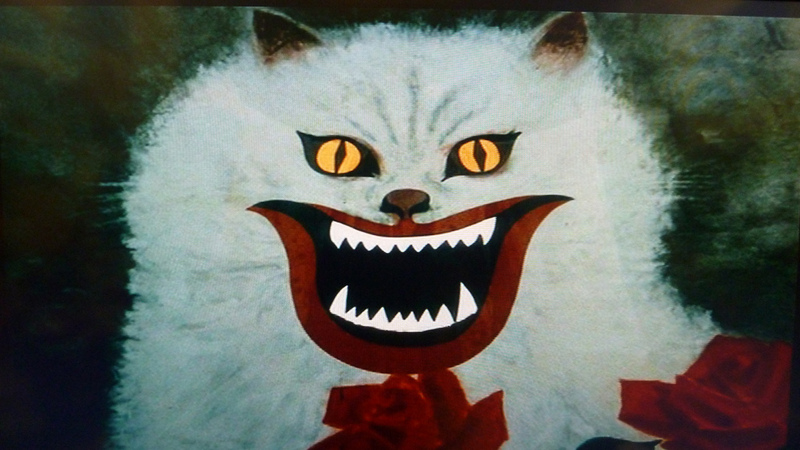 The two most defining elements of Hausu are, without much argument, its bizarre images and odd, often confusing tone. One of the most frequent descriptions I have heard of the movie is that it is like a “fever dream,” and there isn’t really a better way to describe it. There’s a sense of discontinuity between the film’s bleak content, cartoonish color, and whiplashed tone that makes it seem that it could only be the result of madness, and perhaps a wholesale divorce from reality. One of the most impressive aspects of Hausu is its peculiar production design. The prominent matte painting backdrops and clear set pieces are surreal in how transparently artificial they are. In a sort of rejection of traditional wisdom, the design spits in the face of immersion: there is never a moment where the audience could confuse the events in the film with reality. In that sense, I was reminded a bit of The Cabinet of Dr. Caligari, though with a dramatic injection of frenetic color, gore, and LSD. One of my initial issues with the movie while I was watching it was that the characters are incredibly thin, and are mostly boiled down to single character traits. On top of that, the lack of characterization and time on screen for the individual girls makes most of them hard to distinguish from each other. However, as the movie went on, this is an element that started to interest me. Each of the girls have names that are related to their assigned traits, and occasionally to their deaths. 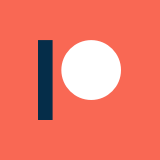 It might be fair to write this off as shallow writing, but at the same time, there is also a debatable element of genre-awareness present as well. Given how transparently artificial the movie’s design is, why wouldn’t the characters follow suit? Whether this screenplay is an example of trope-awareness and genre-deconstruction is something that is probably worth discussing, whether it was intended or not by the writer. Any of these elements I have mentioned so far could potentially be argued as positives or negatives, depending on who you asked about them. I think this is something that makes Hausu a uniquely interesting movie to discuss, and is one of the top reasons that I would recommend just about anyone give this movie a shot. For cult movie fans, it is absolutely essential. But, for everyone else, I think this is still worth watching. I would recommend going into the movie with as little information as possible, however. There are definitely enough highlights to entertain most audience members, though the movie does take a little time to get going, and the slapstick elements are likely to fall flat with many. Today’s entry into the Larry Cohen Collection is Bone, his controversial directorial debut. Bone is a tense and darkly humorous home invasion thriller that presents the story of a robbery that goes rapidly awry, and circuitously winds up unraveling the lives of all of the parties involved. 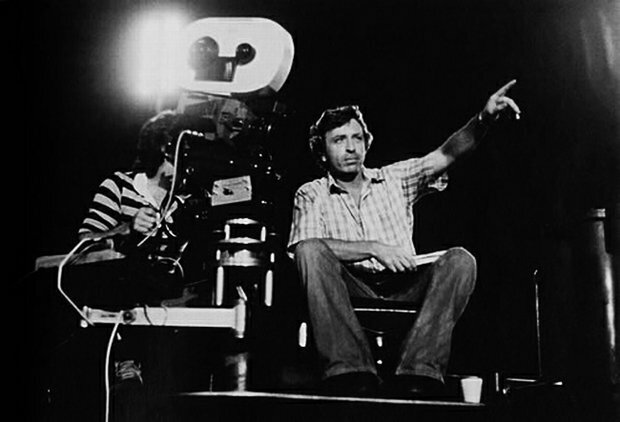 Bone was written, directed, and produced by Larry Cohen as his first feature film, after a notable career as a television writer. It laid the foundations for a long tenure in front of the camera that bounced between genres, and garnered Cohen a significant cult following. The movie was co-edited and shot by George Folsey, Jr. (Hostel, Black Caesar, The Blues Brothers), with Michael Corey (God Told Me To) acting as his co-editor. Aside from Larry Cohen, the producers for Bone included his then-wife Janelle Webb (A Return To Salem’s Lot, The Private Files of J. Edgar Hoover) and Peter Sabiston (It’s Alive, Hell Up In Harlem, Black Caesar). The score to Bone was composed by Gil Melle, who also provided the music for movies like The Andromeda Strain and Killdozer. A number of the effects in the movie were provided by eventual Academy Award winner and master of the field Rick Baker, who worked on a number of Cohen’s films early in his career. 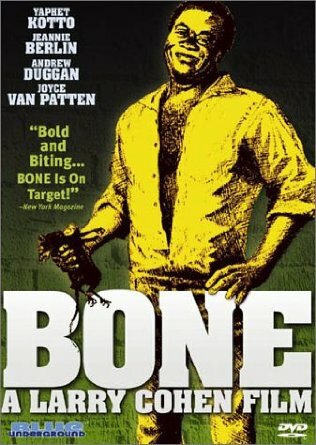 The relatively small cast of Bone includes a young Yaphet Kotto (Alien, Live And Let Die, The Running Man), Andrew Duggan (A Return To Salem’s Lot), Jeannie Berlin (Inherent Vice, The Heartbreak Kid), and Joyce Van Patten (Grown Ups, Marley & Me, The Bad News Bears). Bone proved to be a difficult movie to market, thanks to a combination of controversial themes and pitch-black humor. As a result, it received a handful of alternate titles, though the most ofen seen one is Housewife. Bone was shot almost entirely in Larry Cohen’s own house and property, and even features his dog. While Bone certainly has a positive cult reputation, its reviews on the whole are mixed. It currently holds a user rating of 6.8 on IMDb, along with Rotten Tomatoes scores of 67% from critics and 75% from audiences. Personally, I see Bone as a bold work of a young director with an interesting vision. It is certainly unpolished and the product of a developing talent, but there are some flashes of really fantastic film-making here, particularly whenever a scene calls for a building of tension. Not only do the shots help build a simultaneous sense of uncomfortable distance and dangerously close proximity between the characters, but Cohen was able to get some really outstandingly emotional and creepy performances out of all four of the primary characters. Oddly, the writing is really the weakest aspect of the movie. At first, the film has a clear clock on it to build the tension, but then it is dismissed outright. Honestly, I was a bit confused as to how much time was passing between scenes, and eventually the screenplay just drops the point altogether. Once that happens, the pacing of the movie gets kind of strange, and the last act makes for an odd sort of chase and rapid resolution. Looking back on it, I think this was a screenplay that Cohen wasn’t quite sure how to end, and it shows. As far as a recommendation goes, Bone was definitely made for another time, which plays out as a positive and a negative. The movie provides a visual snapshot of Los Angeles at the time that is pretty cool to look at, but the political and social context behind this movie isn’t nearly as potent now. The humor is also sporadic and uneven, and it isn’t always clear what the message of the movie is. Regardless, as a exercise in building tension, there are some big positives to Bone. On top of that, one scene in particular features some of the earliest makeup work by Rick Baker, which adds a cool trivia bonus to the flick. Cohen fans at the least should check this one out, if you happen to be able to find a copy. Welcome to a special feature here at the Misan[trope]y Movie Blog! 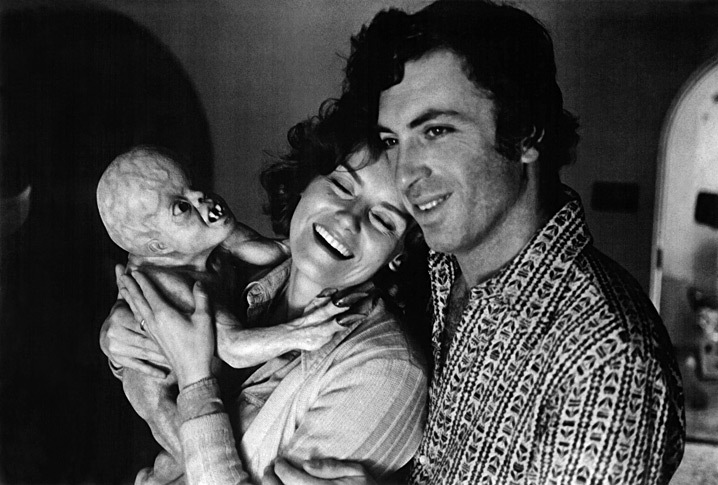 Recently, I had a chat with one of the best known cult movie writer/directors: Larry Cohen. Cohen has had a career that has included hit television shows, blaxsploitation classics, and blockbuster screenplays, but he carved his unique place in film history by writing and directing memorable b-movies like The Stuff, It’s Alive, and Q: The Winged Serpent. For more on his career, check out the Larry Cohen Collection here at Misantropey, where I have been working through his entire filmography. 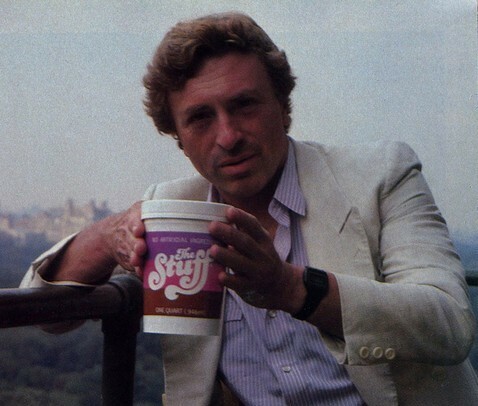 Now, enjoy this interview with the one and only Larry Cohen.